Scrollider is a clean and flexible business/portfolio theme with a unique slider and a variety of custom modules offering portfolio, feedback, and blogging functionality. Scrollider comes with responsive slider which can include background images, text and even video. You can also apply a semi-transparent background overlay to lift it off the background image. Scrollider offers loads of modules and flexibility in terms of layout and customizability. In addition to the featured slider, the theme has a customized widetized homepage where you can add and re-order the included custom components (Features, Portfolio, Blog Area, Testimonials) with the Woo Components widget. The portfolio section powered by it’s own custom post type with a summary of your portfolio viewable on the homepage module and then it’s own portfolio page template. A customized widetized homepage where you can add and re-order the included custom components (Features, Portfolio, Blog Area, Testimonials). Sidebar Manager allows you to replace all widgetized sidebars and footers in this theme with unique custom sidebars. Scrollider has widgetized homepage, custom module widget, 1 widgetized sidebar and up to 4 footer widgetized areas. 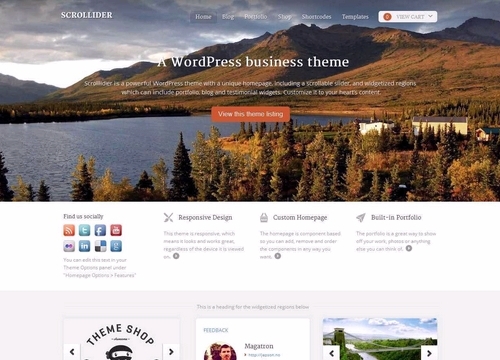 Planning to buy Scrollider theme from Woo Themes. Buy with Confidence. This page provides you with all possible Buying options. Usually Buying options or Pricing page of any theme designer is designed for conversions (to attract users and convince them to buy). Our Buying options page is not like that. We provide all the information about each Buying option. No hidden text or terms. We tried to cover everything that you should know before buying this theme.